Healthy Air Info Day Ostrava – Poruba | ACCENDO – Centrum pro vědu a výzkum, z.ú. The 28th Ostrava Earth Day, within the global Earth Day campaign, focused on environmental issues for more than 45 years, was organized in Ostrava – P oruba, Hlavní třída, on Thurday, 26th April 2018, from 9 am to 4 pm. An interesting program with various activities for visitors was prepared by the Korunka Leisure Center, Ostrava – Mariánské Hory, in cooperation with VŠB – Technical University of Ostrava, OZO Ostrava and other institutions and schools. The topic of most activities was “Life in Motion”, as everything in nature is in motion – water, planets, plants or animals. Visitors were asked to respond to the questions like “What is movement?”, “How can animals, plants and humans move?” or, “What is the meaning of movement for humans and their health?”. Children could see dancing raisins, diving fish, traveling water, movements under a microscope, or they could try to „control“ the movements of the Earth with gestures. Presentations of hawking, foresting, dog sports, meteorology and others were shown there as well. During the event, the activities were accompanied by a range of ecologically-tuned entertainment performances. On e of the most attractive and noisiest displays there was the Smokeman´s interactive show, arranged by ACCENDO – Centre for Science in Research, in cooperation with VŠB – Technical University of Ostrava, within the AIR TRITIA project as a part of the Healthy Air Info Day. The visitors to the Earth Day in Ostrava – Poruba had a chance to learn how they can help to improve the air quality in our region. 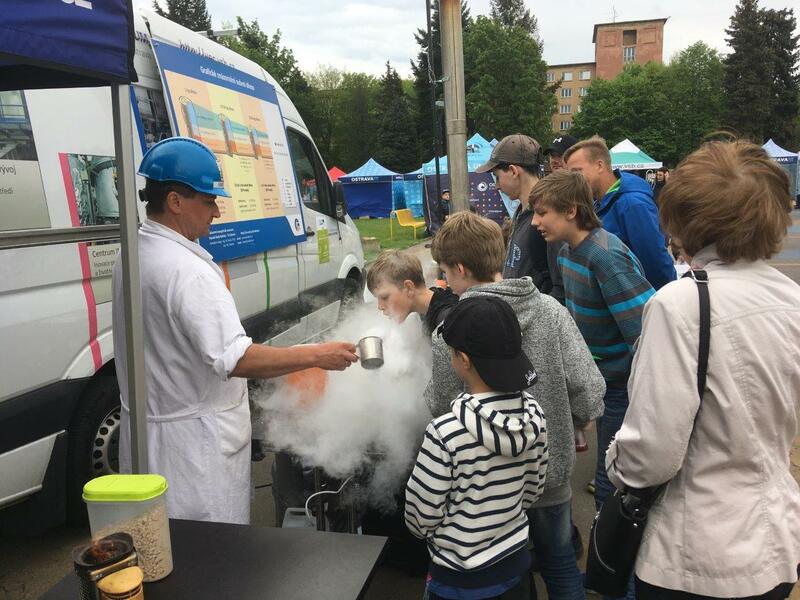 The interactive show “SMOKEMAN ZASAHUJE” (Smokeman in action), designed for both children and adults, presented the methods of proper combustion in local boilers to the general public. The Smokeman is a guy who does not like smoke. He tries to explain people how burning solid fuels at domestic combustion boilers affects the quality of the air we have to breathe. The Smokeman alias Jiří Horák, the head of the Research Centre at VŠB – Technical University of Ostrava, says that recent measurements show that even a small chimney can produce a large amount of air pollutants and degrade greatly the quality of the air. According to him, combustion of fuel in domestic boilers can be compared to the relationship between a man and a woman: in order to “react” together, several conditions need to be met – they have to meet at the same place, get closer to each other, they must be ready, need time and space. To burn the fuel reasonably, it needs oxygen, temperature and time. For example, using wet wood for burning is like pouring water into the stove or boiler. 1. Do not be indifferent to yourself or to your surroundings, be concerned about what comes out of your chimney. 2. Dry up the wood for at least one to two years. 3. Do not burn garbage. 4. Set the control flaps to allow the air to the fuel, do not smother the fire. 5. Apply more often a smaller dose of fuel than one large dose over a long period of time. 6. Clean the boiler and chimney regularly. 7. Use a modern boiler or stove. 8. Keep the flue gas temperature between 150 ° C and 250 ° C.
9. Do not let the heat out of the window, do not overheat your rooms, and use the heating only if you really need it. 10. Use your combustion boiler in the way you would like it to be used by your neighbour. The Smokeman explained how to determine the efficiency of a domestic combustion boiler, how much it is important to be aware of what comes out from our chimneys. He also presented the basic types of combustion constructions, their basic characteristics, how to operate boilers, stoves and fireplaces in the right way, and how to take a proper care of them. A lot of interesting tasks were prepared for children. They could take part in various measurements and find out how bad the incineration of domestic waste is comparing to burning the dry wood. A very popular experiment among the children was the demonstration of inversion in the aquarium. The simple experiment allowed the children to learn how the inverse arises and how they can create an inversion themselves using kitchen salt, water, and food colouring. In addition, children could try to measure flame temperature using a thermocouple or thermal camera. For bold children, a less traditional method of making fire was prepared – making fire using a rocket. The show was presented in an amusing and engaging form. As a part of the Smokeman interactive show, an AIR TRITIA Information Stand was placed right next to the Smokeman´s display. The visitors had a chance to test their knowledge of the TRITIA region geography and air pollution prevention. 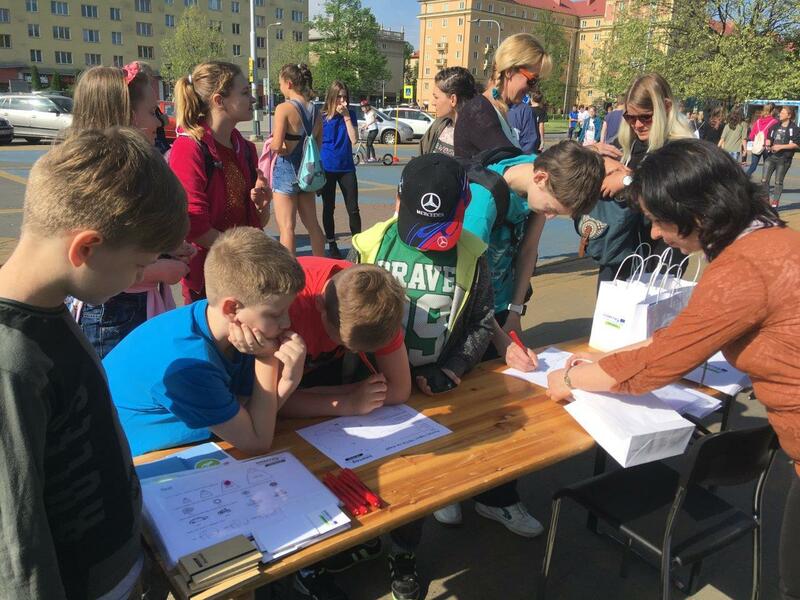 After they had completed a quiz, they were given a little prize – the promotional items of the AIR TRITIA project – a small notepad, a pen, a thematic colouring picture, and a small paper bag. About 300 visitors stopped at the AIR TRITIA Stand, mostly children aged 8 – 15, and about 250 of them completed the quiz. We were very pleased to welcome among the visitors also the representatives of the Central Mining Institute of Katowice, Mrs. Małgorzata Wysocka and Mr. Kristian Skubacz, and from University of Žilina, Mrs. Veronika Mešková, who arrived to Ostrava Earth Day and used the opportunity to observe the atmosphere of the event.